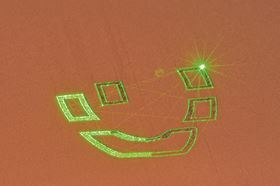 Exposure of a single layer in a SLM process with green laser light to manufacture an internally cooled coil for inductive heat treatment. The aim of the technology is to make SLM more suitable for the additive manufacturing of components made of copper alloys and pure copper by using a specially developed laser beam source that operates with green rather than infrared light, the researchers say. ‘Depending on surface properties, pure copper reflects most of the laser radiation in conventionally used wavelengths of 1µm,’ said Daniel Heussen, research fellow in the Institute’s Rapid Manufacturing group. However, by ssing green laser light with a wavelength of 515 nm the absorptivity of pure copper is much higher and less laser power output is needed for a stable process. Moreover, the laser beam can be focused more precisely, allowing it to manufacture far more delicate components using the new SLM process, according to Fraunhofer. ‘We are hoping for a more homogeneous melt pool dynamics so that we can build components with high material density and achieve other positive effects, such as a higher detail resolution,’ said Heussen. The researchers plan to create a high-quality laser for single-mode operation that functions with a maximum output of 400 watts in continuous service (cw) with green wavelength (515 nm). This in turn could create a reliable process with which industrial users can 3D print complex geometries of pure copper with hollow structures and undercuts. The process can be used for heat exchangers and heat sinks or for the production of delicate, complex electrical components in small batches. The green laser could also be suitable not just for copper, but also non-ferrous and precious metals in the jewelry industry. The publicly funded project will reportedly run until mid-2019. This story is reprinted from material from Fraunhofer, with editorial changes made by Materials Today. The views expressed in this article do not necessarily represent those of Elsevier.